Hosting the most diverse and dense primate populations in Africa, Kibale National Park is a popular destination for visitors. 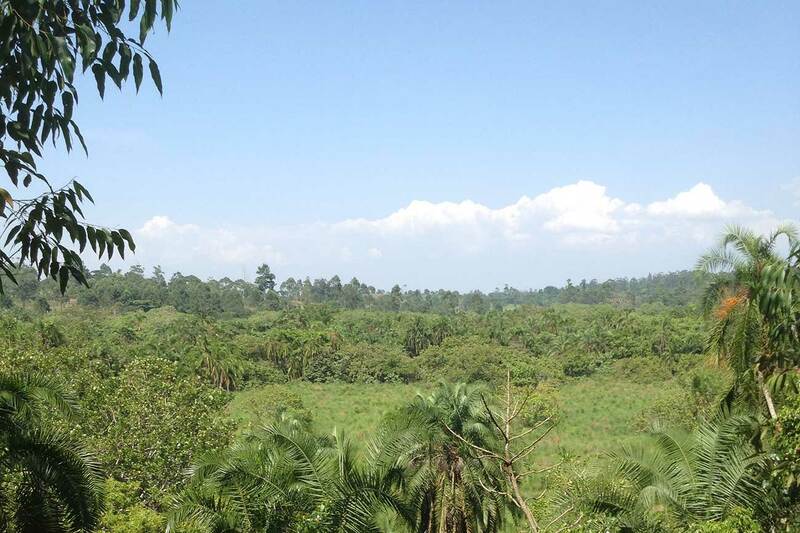 Its tropical forest, semi-deciduous woodland and patches of grassland and swamp offers some excellent wildlife viewing opportunities, especially chimpanzee tracking and habituation with expert guides and boasts 351 tree species. Bigodi Wetland Sanctuary. This wetland lies just outside the Park, is managed by the local community and is rich in biodiversity. There are 138 species of birds in the area, along with eight species of primates, which can be spotted during guided walks along the boardwalk trail and viewing platforms. Animals: chimpanzees, red colobus, black and white colobus, l’Hoest’s monkey, red-tailed and blue monkeys, grey-cheeked mangabey, olive baboon, bush baby, potto, elephant, buffalo, leopard, warthog, and duiker. Birds: African Pitta, Green-breasted Pitta, Afep Pigeon, White-naped Pigeon, White-Winged Warbler, Crowned Eagle, Red-chested Owlet, Black Bee-eater, Western Nicator, Yellow-rumped Tinkerbird, Little Greenbul, Brown-chested Alethe, Fire-crested Alethe, Blue-breasted Kingfisher, African Grey Parrot, Scaly-breasted Illadopsis ,Brown Illadopsis, Black-capped Apalis, Blue-headed Sunbird, Collared Apalis, Dusky Crimsonwing, Purple-breasted Sunbird, Red-faced Woodland Warbler, Yellow Spotted Nicator, Little Green Bul, Black-eared Ground Thrush, Yellow bill, Dusky Long-tailed Cuckoo, Joyful Greenbul, Chubb’s Cisticola, Cameroon Sombre Greenbul, White-spotted Flufftail, Black Cuckoo, Cassin’s Grey Flycatcher, White-bellied Crested Flycatcher and Abyssinian Ground Thrush.